Figure 1. Coal is delivered to the plant via automated rail wagons. Figure 2. The second motor installed is also a MGF high-voltage unit from WEG's M-Line of high voltage units. It drives an absorber recirculation pump on one of the FGD towers. Figure 3. The largest of the WEG motors is an IEC 1000 frame size 6150 KW, 10 pole, 11 KV M-line unit. A pdf version of this article is avilable on the right-hand side under 'Downloads'. Ratcliffe Power Station, situated near the River Soar in Nottinghamshire is recognised as one of the most efficient coal fired power stations in the UK. The site has a generation capacity of 2,000 MW from four 500 MW units, enough to power around 1.5 million homes. The site covers 700 acres and has been producing electricity for over forty years. The site takes its environmental responsibility seriously, ensuring that its impact on the surrounding area is kept as minimal as possible. Large numbers of native trees and shrubs have been planted and a biodiversity action plan exists to enhance the ecological value of the land. Its flue gas desulphurisation (FGD) plant, commissioned in 1993, is the centrepiece of the drive to reduce SO2 emissions while also creating commercial quality gypsum. The site is run with efficiency as a top priority and the main criteria when sourcing motors were energy efficiency and reduced maintenance requirements. 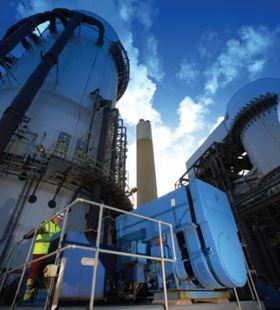 The Ratcliffe Power Station owner, power and gas specialist E.ON, decided to install two new large WEG motors. The first motor to be installed is a 6150 kW, 10 pole, 11 kV WEG M-line MGF 1000 unit used to drive the booster fan on the FGD plant. The motor is an IEC 1000 frame size with an output torque of over 100,000 Nm and is the largest of the WEG motors currently installed at the power station. The booster fan is used to power the flue gas through the FGD plant. The second motor installed is also a MGF high-voltage unit from WEG's M-Line of high voltage units. It has a smaller IEC 400 frame size MGF 400E 750 kW, 4 pole 3.3 kV motor. This motor drives an absorber recirculation pump on one of the FGD towers. These pumps are used to transfer up to 8,000 tonnes of limestone slurry an hour to the top of the 50 m high towers to be sprayed into the flue gas. Both motors are reportedly highly efficient, the larger unit up to 96.4% at peak efficiency and the smaller motor at 95.4% efficiency. WEG motors are designed to be compact and robust, using cast iron frames and corrosion resistant finishing and galvanised mounting components. The windings are sealed using a Vacuum Pressure Impregnation (VPI) system which offers high quality insulation and stator coil protection through the application of an epoxy based resin. The desulphurisation process passes flue gas through a heat exchanger to cool it below 90°C. The gas is then drawn into the tower where it comes into contact with the limestone slurry. This creates a chemical reaction, removing the SO2 and converting the limestone into calcium sulphite (which is in turn processed to create commercial quality gypsum). During this process, 95% of the hydrogen chloride is also removed. Once the SO2 has been removed the gas is reheated to allow it to rise through the chimney. As the FGD plant plays such a vital role in cleaning the emissions from the power station it is vital that down time is kept to a minimum. This means that all equipment in the plant must have the longest operating life possible with low maintenance requirements. It was important that the new motors were able to survive in an outside environment for a long period, working at a continuously high load. Operating temperature is crucial to both the efficiency and the longevity of electric motors, and so the WEG units employ a combination of an internal cooling circuit, external cooling fins and cooling fans to guarantee an optimum temperature gradient within the motor. These, coupled with specifically dimensioned bearings help extend the running life of the motors. The WEG motors also have dynamic balancing at motor operating speeds. In this case the standard balancing is on two planes. Both are capable of very low vibration levels. WEG also employed a pressure grease relief system enabling old grease to be removed and replenished with new while the motor is still running, reducing the need for maintenance down time.